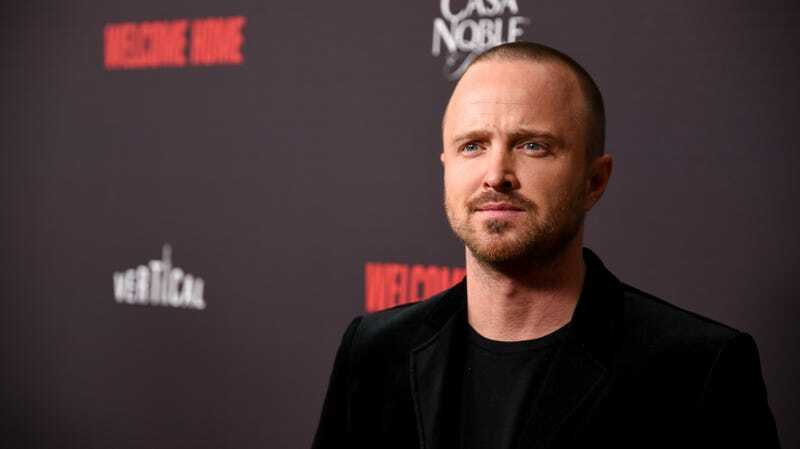 Just a few hours ago, we reported that Vince Gilligan was developing a Breaking Bad movie about “the escape of a kidnapped man and his quest for freedom.” That was literally all we knew, but now /Film has “confirmed” that the kidnapped man is none other than Aaron Paul’s Jesse Pinkman and that the plot of the movie will directly follow the events of the series finale. None of that has been officially announced, so we don’t know if it’s true, but it does seem like a relatively safe assumption. Jesse got kidnapped by Nazi meth guys who forced him to replicate Walter White’s recipe near the end of the series, and he only escaped when Walt showed up and murdered everybody with a robot machine gun that he built into the trunk of a car. Walt died after being reunited with his true love, a meth lab, while Jesse drove off into the night in a fit of screaming laughter. (It was a wild finale.) Jesse seemed to be free at the end, but it would be pretty easy for Gilligan to introduce some other bad guys who want to stop him from getting away and opening up the “quest for freedom” teased in the movie’s description. Basically, the pieces fit, whether or not AMC and Vince Gilligan have come right out and said that this is the correct shape. Meanwhile, Bryan Cranston himself has offered his own thoughts on the movie, telling The Dan Patrick Show (via Birth. Movies. Death.) that he hasn’t read a script for the Breaking Bad movie and that he has no idea if there’s a place for Walter White in it. He does cautiously admit that he believes the movie is about “a couple of the characters” who did not really finish “their journey,” which seems to back up the Jesse Pinkman idea, but that’s all he’d say. It’s worth repeating, though, that Walt definitely did die in the finale, so bringing him in would require either ghosts/hallucinations or flashback shenanigans—neither of which would be totally unheard of.